Heat oven to 350°F. 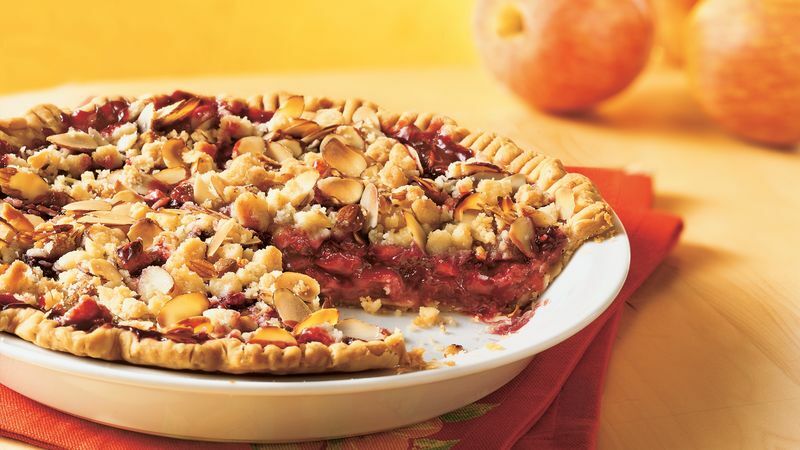 Place pie crust in 9-inch glass pie plate as directed on package for one-crust filled pie. In large bowl, stir together apples, 1/2 cup sugar and 2 tablespoons flour and the cinnamon. Spoon into crust-lined pie plate. Sprinkle with raspberries. Sprinkle almond paste over raspberries. In medium bowl, mix 1/2 cup flour and 1/4 cup sugar. Cut in butter, using pastry blender or crisscrossing 2 knives, until particles are size of small peas. Stir in almonds. Sprinkle evenly over almond paste. Bake 1 hour to 1 hour 20 minutes, covering edge of crust with foil after about 30 minutes, until apples are tender in center and surface is golden brown. Serve warm or cooled. Look for almond paste near the baking chocolate and nuts. Check the label to make sure it lists almonds as the first ingredient. If pieces of the almond paste are sticking out, tuck them into the crumb topping so they don’t brown too quickly. This luscious pie is terrific with a scoop of vanilla ice cream. You can make the pie several hours before serving. To warm it up, microwave pieces on individual microwavable plates on High for about 10 seconds.